The Missouri Territory was admitted to the Union on August 10, 1821, making it the 24th state. Called the Brothel Law, it is illegal in Missouri for more than four unrelated persons to occupy the same dwelling. The ice cream cone was invented at the Missouri World’s Fair in 1904 when an ice cream vendor ran out of cups and asked a waffle vendor to help by rolling up waffles to hold ice cream. Worrying squirrels is not tolerated in Missouri. The most powerful earthquake to strike the United States occurred in 1811, centered in New Madrid, Missouri. The quake shook more than one million square miles and was felt as far as 1,000 miles away. 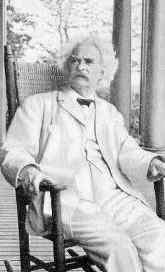 Samuel Clemens, more familiarly known as Mark Twain, was born in Florida, Missouri and grew up in nearby Hannibal. Beginning his career as a printer’s apprentice for the Missouri Courier in Hannibal, he eventually wrote for the Keokuk, Iowa Saturday Post. Soon thereafter, however, he abandoned his literary career and spent 18 months as a riverboat pilot on the Mississippi River. After the Civil War, he returned to writing for newspapers and magazines, before writing his novels based on life on the Mississippi River, such as Tom Sawyer and The Adventures of Huckleberry Finn. St. Louis offers more free, major visitor attractions than anyplace outside of the nation’s capital. These include the Saint Louis Art Museum, Saint Louis Zoo, Cahokia Mounds, Museum of Westward Expansion, St. Louis Science Center, Missouri History Museum, Anheuser-Busch Brewery, Grant’s Farm and more. It is unlawful to throw hard objects by hand in Missouri. Kansas City is known for its barbeque cuisine beginning in 1908 when Henry Perry, the “Father of Kansas City BBQ” started selling his smoked meats in an alley stand in the Garment District. As his tasty food gained popularity he moved up until he was running his full-time operation out of an old railroad car near the famous corner of 18th & Vine. 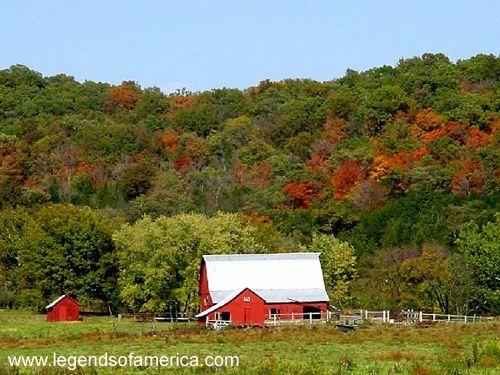 Daniel Boone lived longer in Missouri than in any other state and regarded Missouri as his home. Harry S. Truman was born in Lamar, May 8, 1884, and was raised in Independence. Beginning as a successful Missouri farmer, he served in France during World War I and after the war opened a men’s clothing store in Kansas City. An active Democrat, he became a Senator in 1934. As the 33rd President of the United States, Truman ordered the use of atomic weapons against Japan at the end of World War II. Missouri was the third most fought-over state in the Civil War, right after Virginia and Tennessee. The first train of the Atlantic-Pacific Railway, which became the St. Louis-San Francisco Railway, or “Frisco,” arrived in 1870. “Madonna of the Trail” monument in Lexington tells the story of the brave women who helped conquer the west and is one of 12 placed in every state crossed by the National Old Trails Road, the route of early settlers from Maryland to California. In Buckner, Missouri, yard waste may be burned any day except Sunday. Warsaw holds the state record for the low temperature of -40 degrees on February 13, 1905. It also holds the state’s high-temperature record when it reached 118 on July 14, 1954. Missouri ties with Tennessee as the most “neighborly” state in the U.S., bordered by eight states. St. Louis is also called, “The Gateway to the West” and “Home of the Blues”. Ozark folk wisdom says that splitting a persimmon seed into 2 thin halves will reveal an omen of the coming winter’s weather. If the seeds reveal “spoons,” they point to shoveling snow. “Fork” images foretell light snow and “knives” portend cutting cold winds. On July 3, 1985, the honey bee was officially declared the state insect. 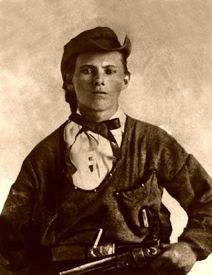 Jesse Woodson James was born in Kearney, Missouri, the son of a Baptist minister. Some believe that cruel treatment by Union soldiers during the Civil War was what turned Jesse and his brother Frank to a life of crime after the war. Their first bank robbery got them $60,000 from a bank in Liberty, Missouri. For 15 years, Frank and Jesse robbed trains and banks throughout the US. In 1876, Jesse and Frank were involved in a robbery along with the Younger Brothers and other gang members. The Pinkerton detectives killed or wounded all of them except Frank and Jesse. From that point, Jesse, his wife, and children went into hiding, but the $10,000 price on Jesse’s head led Bob Ford to shoot him at his St. Joseph, Missouri home in 1882 to collect the reward. Laura Elizabeth Ingalls, writer of Little House on the Prairie settled in Missouri with her husband Almanzo Wilder. The first ready-mix food to be sold commercially was Aunt Jemima pancake flour. It was invented in St. Joseph, Missouri and introduced in 1899. Missouri has an official state rock – the Mozarkite adopted by the Missouri legislature on July 21, 1967. During Abraham Lincoln’s campaign for the presidency, a dyed-in-the-wool Democrat named Valentine Tapley from Pike County, Missouri swore that he would never shave again if Abe were elected. 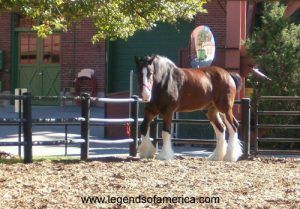 Tapley kept his word and his chin whiskers went unshorn from November 1860 until he died in 1910, attaining a length of twelve feet six inches. Before 1866 it was illegal to educate blacks in the state of Missouri. The Reverend John Berry Meachum found a way around the law by taking his students out on a boat in the middle of the Mississippi River and holding class. In the early 19th century, the folk song, Shenandoah, was sung about a trader in the Missouri River area who fell in love with the daughter of the Algonquian chief, Shenandoah. Sailors heading down the Mississippi River took up the slow, rolling melody for the slow, rolling work of hoisting a ship’s anchor, changing the words to suit their purpose. Installation of bathtubs with four legs resembling animal paws is prohibited. Sedalia has been called the cradle of classical ragtime. The soft drink Dr Pepper was introduced at the 1904 World’s Fair in St. Louis. 7-Up also was invented in St. Louis.